Are you running a mobile network with radio access that has multiple bands and multiple radio technologies? Are your cell sites running out of space? Looking to cut operational expenditure and make your networks simpler and future proof? As we continue our series of blogs about Nokia AirScale Radio Access, we look at how a more integrated approach could help. Many operators have responded to the huge growth in data consumption by transforming their mobile networks into including more bands and newer more efficient radio technologies to meet customer expectations and manage this growing traffic. Yet, adding more bands and RATs (Radio Access Technologies) also racks up the expenditure - roll-out costs, equipment space needed at cell sites, energy bills, site rents, network future-proofing all tend to rise. What can be done to reign in these costs? The answer is more integration – more integrated and compact hardware that allows using fewer boxes and cables. So we looked at our AirScale Base Station and asked how we could make it work better for operators. The results were unveiled at Mobile World Congress 2017. From launching the world’s first triple band radio, a new dual band radio, new FDD & TD-LTE radios and a new variant of Flexi RF Module, to improving the baseband processing of the base station. The outdoor baseband subrack is now capable of supporting five RATs - 5G, FDD LTE, TD-LTE, 3G, GSM. This means fewer boxes and cables and lightweight hardware that’s compact in size, easy to install and needing less operation and maintenance work. The number of spare parts is also cut. The result? Operating costs are slashed, but not at the expense of performance, which can often be the case. The new AirScale radios actually offer higher data rates and enhanced network performance. For the nuts and bolts on how this works in practice, keep reading! How can Nokia AirScale radios cut costs and improve performance? The triple band and new dual band radios offer the industry’s highest output power of 240W for Remote Radio Head (RRH), allowing leaner sites and reduced energy consumption. The new single band radios, with 160W output power, offer 4x4 MIMO support. The new variant of our unique 6T6R Flexi RF Module, with an industry high output power of 360W for integrated 3-sector RF Module, offers the most compact 3-sector 2x2 MIMO solution in a single box. The new 5 RAT capable AirScale outdoor baseband subrack also allow faster roll outs in multi-RAT operations, while providing an easy way to adapt and evolve Flexi Base Station sites to meet the 5G and IoT challenge. AirScale and Flexi platforms are compatible with each other, allowing the easy mixing and matching of base station elements. Visit our AirScale Radio Access page and see our launch press release for more on our latest developments. 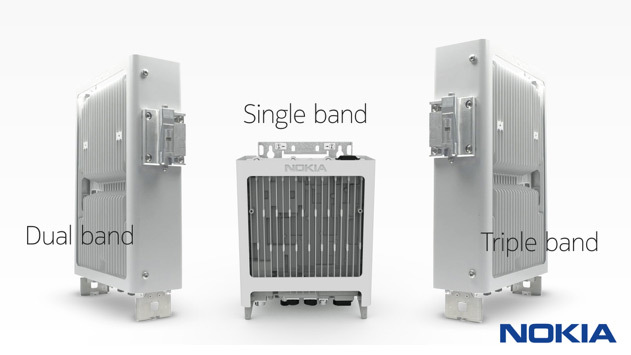 Download the brochure "Nokia AirScale Base Station - Changes the way to build networks" . Is your radio network single-minded yet?